It’s all or nothing this week for the 18 European nations competing in the Men’s World Championship 2019 Play-off. The second leg will decide which nine teams advance to the final tournament in Germany and Denmark in January. While some ties seem more or less decided after big wins for one of the teams in the first leg, other ties are still very much in the balance. The second leg of the play-off takes place on Tuesday, Wednesday and Thursday, and for all matches the EHF live ticker is available. Even though trailing by one goal before a return match at home seems no big deal, Russia were not content with the result from the away leg as Czech Republic were only leading twice: 1:0 and 27:26, which was the final result. Russia, which even led by seven goals at one point, will be eager to overcome the minor deficit in Perm on Tuesday afternoon. The match is pitting two former top players, now coaches, against each other: Rusland’s Eduard Koksharov and Czech Republic’s Jan Filip. Question is which one of them is the better tactician, and who is better at making his players carry out his thoughts? Things could have turned out much worse for Switzerland in the first match in Stavanger. At some point, hosts Norway were leading by 11 goals - mainly thanks to Sander Sagosen’s 10 goals within the first 38 minutes. However, Switzerland ‘won’ the second half and closed to gap to six, giving them still some hope ahead of the decisive leg in Zug on Tuesday evening. The crowd in the Horea Demian in Cluj Napoca is known for being enthusiastic. Their support certainly will be needed by Romania on Wednesday evening when the home team will try to make up an eight-goal deficit from the first leg in Skopje. FYR Macedonia were pretty dominant throughout their home game, and they should be able to avoid serious troubles if they keep up their level of play. Romania have not been at a World Championship since 2011 in Sweden, and it will take them a major upset to qualify for the 2019 edition in Germany and Denmark. Hungary will enter the Veszprém Arena as favourites to advance to the final tournament after their first meeting with Slovenia took a highly surprising turn in the closing minutes last Saturday. Slovenia led by three goals for large parts of the first half, and the match was still very much in the balance (23:23) when a 6:0 series for Hungary put the match upside-down. So Slovenia, the bronze medallists in France in 2017, are now close to missing out a trip to Germany and Denmark in 2019. The Netherlands created the surprise of the first leg as they defeated Sweden, the EHF EURO 2018 silver medallists - their first win ever against the Scandinavians. Can the Dutch team hold on to this minor lead in the Kristianstad Arena on Wednesday evening? 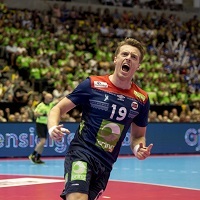 Sweden will count on frenetic support from the usually loud fans in Kristianstad, and line player and defender Max Darj is hopeful his team can turn the tables. “Fortunately we only lost the first match by one goal, so our destiny is obviously still in our own hands,” Darj said. Lithuania also pulled some kind of a surprise by holding Iceland to a draw in Vilnius in the first leg. Still, Iceland will go as clear favourites into the return game. Also, the Laugardalshöll of Reykjavik has been a strong fortress for the Icelandic national team many times before. A win by any margin will do for Coach Gudmundur Gudmundsson’s Vikings to get into the bowl for the final tournament draw, at the City Hall of Copenhagen on 25 June. After the draw from the first leg, the winner takes it all in Austria on Wednesday night. Austria would have loved to return with some buffer from their away match in Minsk as they were leading by four goals several times in the second half. Still, the draw leaves them every chance to finish the job in the Albert Schultz Eishalle in Vienna. Even though the crowd in the S. C. Moraca of Podgorica is known for their enthusiasm, it is doubtful whether their support will be enough for Montenegro to catch up with the huge deficit from the first match in Osijek. The match was in the balance for the opening phase before Croatia simply outplayed their opponents during the remaining 40 minutes to build a virtually insurmountable 13-goal lead - the biggest difference in any first-leg match. Croatia, fourth-ranked in France in 2017, have missed the World Championship only once – in Germany in 2007. They are not likely to miss it for a second time. Both teams are trying to get back to a World Championship after missing several editions: Serbia failed to qualify for Qatar in 2015 and France in 2017, while Portugal are waiting for their first appearance since hosting the event in 2003. Serbia are in a strong position to end their draught after leaving a convincing impression in Nis on Sunday. The seven-goal margin certainly put Portugal under a lot of pressure, though they hope to make up the difference with the support from the crowd in the Pavilho Municipal in Provoa de Varzim on Thursday.